You might be frying eggs and bacon or spreading peanut butter on your toast, but we have something better for you. March 12 is National Baked Scallops Day, that is why we start this day with the shellfish. Scallops is the whole family of different salt-watered clams, that can be found in all of the world's oceans. They are very popular and highly prized as a food source. 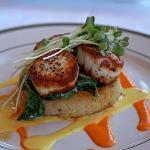 Scallops are low in fat and can be prepared in hundreds of ways. Mostly they are served as a delicious entree, but they are also great as appetizers. As far as today we celebrate Baked Scallops Day, it's the best way to cook them. Scallops traditionally served sautéed in butter in their own shell. But this type of cooking makes scallops fat and buttery. And baking leaves it all out of this lean seafood. Think about it and baked scallops will be the fanciest dinner you have this week. Serve baked scallops with parsley, spinach or salad leaves, they are also great with simple vegetables, rice and baked potatoes as the accompaniment.